The La Palina Mr. Sam was formerly released in 2013 as a limited edition cigar in honor of La Palina founder, Sam Paley. “Mr. Sam” was the nickname the workers at the original factory called their beloved boss. Now in full production, Mr. Sam is rolled at the small boutique factory, El Titan de Bronze, on the famous Calle Ocho in Little Havana. El Titan de Bronze also produces the legendary La Palina Goldie. 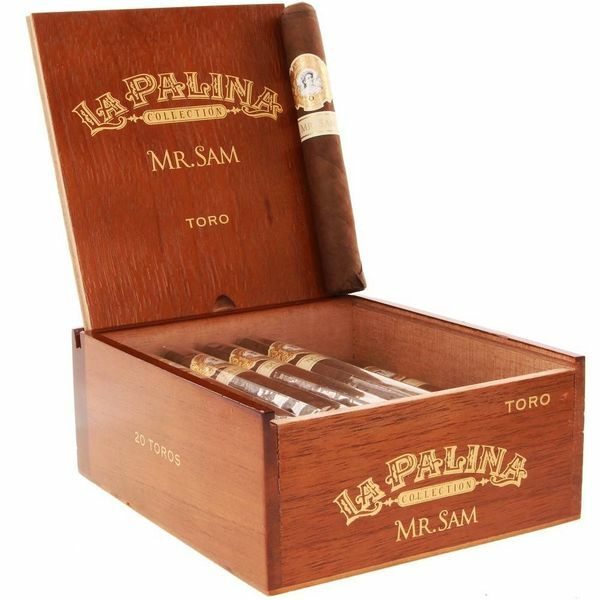 The Mr. Sam Toro has a dark chocolate brown Ecuadorian wrapper which is slightly oily with a velvety soft sheen. The rich Nicaraguan binder and filler compliments the wrapper with notes of wet oak, rich cocoa, and tones of earth making this a premium smoking experience. Calle Ocho is the cultural mecca of Cuban life in the historical Little Havana neighborhood in Miami. The neighborhood has more Cubans in the world other than Cuba itself. The restaurants, bars, Cuban-style buildings and markets, Havana and Calle Ocho all represent the Cuban “La Vida Dolce” – the sweet life. My friends and I arrived on Calle Ocho (SW 8th Street) on a late Friday afternoon to start our annual Little Havana bar crawl. First we had to fill up or bellies to prepare for our endless smoking adventure. Our first stop was Ellas, a classic oyster bar in the heart of Little Havana. I ordered a pint of locally brewed La Finca Belgian-style Saison and we all sampled a few dozen West and East coast oysters. Next stop was El Cristo on the avenue for a more substantial meal. The casual family owned restaurant was packed with locals enjoying Cuban lunches but we found room on the back patio. We shared a pitcher of Mojitos and the Picadera Habanera, a Havana Sampler of beef and chicken empanadas, green plantains, ham croquette, and fried yucca. All were excellent. After a delicious meal, we continued our walk along Calle Ocho. The famous avenue is an art lovers dream. Murals are featured on almost every building. The paintings honor all aspects of Cuban culture. We spotted a cartoonish mural of Pitbull on one building. On another, a collage representing American and Cuban political figures. At Maximo Gomez Park, aka Domino Park, lies a mural of The Beatles mimicking the iconic Abbey Road walk this time on dominos set in the pavement. Finally, we grabbed a bench at Maximo Gomez Park and I opened up my 5 pack caddy of Mr. Sam Coronas to share with my three best friends. We smoked, drank Cuban coffee and watched as older Cuban men played Dominos as fierce as a Toreador fights El Toro.